In recent years, a whole new field of inquiry on the connections between social class and health has arisen from the work of leading social scientists and medical researchers around the world. This pioneering two-volume reader collects for the first time the substance of their main finding: that variations of health within a population are primarily related to sociostructural factors, including income inequality, educational differences, lack of opportunities, and racism. 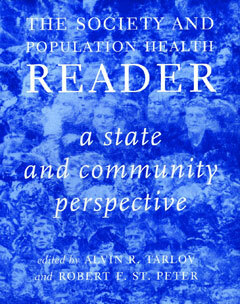 Featuring sixteen original essays by preeminent researchers in the field, The Society and Population Health Reader: A State and Community Perspective, includes in-depth studies of the links between health and childhood development, race and ethnicity, social status, stress, and other sociocultural factors. It also features a section on the implications of its findings at the state and municipal level, and suggestions for policy changes that would improve health throughout society. Contributors include Michael Marmot, Ichiro Kawachi, Benjamin C. Amick III, J. Fraser Mustard, Richard G. Wilkinson, David R. Williams, Clyde Hertzman, and Stephen B. Fawcett. Sure to provoke widespread debate and controversy, The Society and Population Health Reader brings to professional, academic, and general readers the most important research findings and dramatic implications for public policy of this fascinating new field. A companion volume, The Society and Population Health Reader: Income Inequality and Health, edited by Ichiro Kawachi, Bruce P. Kennedy, and Richard G. Wilkinson, is also available from The New Press. Robert F. St. Peter is the president of the Kansas Health Institute.